Welcome to the Duets videoblog! 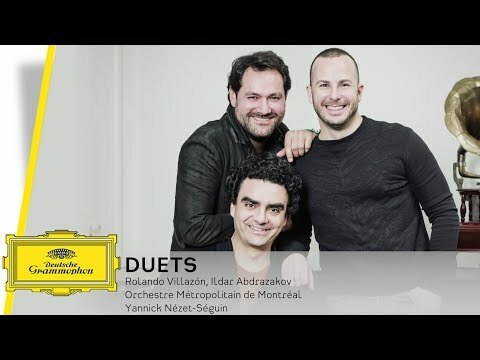 Rolando Villazón, Ildar Abdrazakov and Yannick Nézet-Séguin join forces for an operatic treat! Learn interesting insights about the album 'Duets' on our videoblog, with weekly new videos. Apart from famous opera duets, the album also contains songs like "Granada" by Agustin Lara, orginally composed for one voice and on this album arranged for two by Julian Reynolds. Listen to Rolando Villazón telling some interesting insights about the recording session in Montreal! Listen to Rolando Villazón, Ildar Abdrazakov and Yannick Nézet-Seguin explaining how the idea of recording this album emerged and what were their favourite moments of the process. Have a glimpse on the repertoire on the album and hear the artists make some comments on particular pieces that have a special meaning to them! Do you want to know what were the most emotional moments of the recording session for the three artists? Watch the video and discover!